Here in the Pacific Northwest we are still experiencing way too many April showers for my liking! I am anxious for summer weather, shorts, sandals, and BBQ's. There are many new summer patterns that are popping on to the scene now, making the inspiration for summer sewing hard to resist. The new Pants patterns that are popping up are AMAZING! Check out - Ann Normandy pattern. 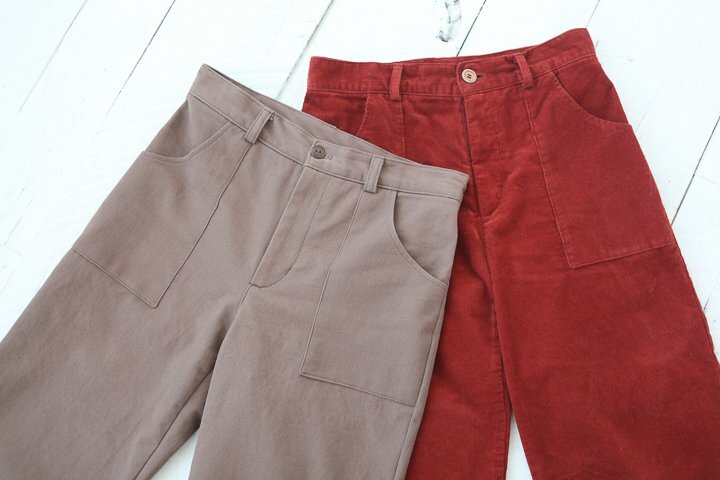 These pants are flattering and impeccably fitting classic flat front pants. They have a side zipper, deep welt pocket, shaped waistline, straight leg with flared godets on inseam and side seam to give a wide-legged appearance without bulk. The pattern is designed to work with medium to heavy weight linen, denim, cotton twill and raw silk. We have ALL of these fabrics in the Sewing Studio. The next pattern I am over the moon with is an amazing cropped pant called the Persephone Pants + Shorts. These pants are based on the US Navy sailor pants of the 1920'-40s. 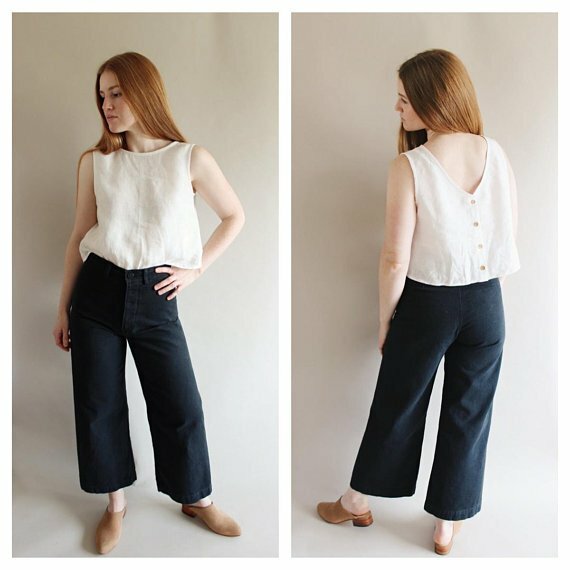 This is a high waist pant pattern that are unique as they do not have a side seam. The front and back legs are cut from one piece. They have a concealed button fly, front waist in-seam pockets, belt loops, and two back waist shaping darts. These are perfect for woven non-stretch fabrics, but you can use fabrics with a 3-5% stretch. Try these in the Bull Denim on our site! You will be amazed at these pants by Anna. If you really love them and don't have the energy to make them yourself, Anna will make you a pair! You can order on her Etsy site - Annaallen. And a HUGE shout out to Kelli for adding the Lander Zipper Expansion Pack. Woot woot! These pants are known by almost everyone in the sewing community, but now there is a new option to create a different look. With Short season approaching, grab this expansion and get sewing! These are perfect for the Bull Denim in our Studio - Kelli even ordered some for herself! So, these are few of my favorites of the minute. I know as summer heats up I will want looser and lighter clothing, but with the April showers still out my window, these are all perfect makes that will be TNT patterns for months to come. Check out all the NEW fabrics on the site. Most of the fabrics from my trip to LA Textiles have arrived, and I am adding to the site as fast as they arrive. If you are an Instagram follower, you will see them as fast as they are added! Also new are Sew Over It patterns. Most of these are perfect for our new Viscose, Rayon Challis and Rayon Crepes. They are going to be spot on for summer. Lastly, if you have been wanting to sew with Silk Noil grab yours NOW! We added a few deep colors to get your sewing ideas going. This is the most amazing fabric, and is not hard to sew. Grab yours at a wonderful price!